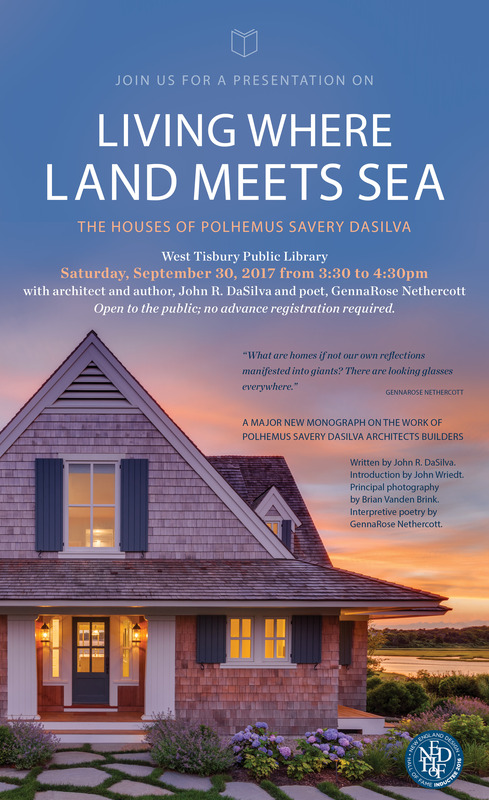 On Saturday, September 30th from 3:30-4:30pm at the West Tisbury Library, architect and author, John R. DaSilva and poet, GennaRose Nethercott discussed both PSD’s new book, Living Where Land Meets Sea: The Houses of Polhemus Savery DaSilva, and the links between architecture and poetry. They talked about their collaboration, showed images of the architecture, and read poems that have resulted from it. Since publication of the book, Nethercott has continued to write poems about the firm and its work, most recently appearing in Falmouth and Provincetown Arts magazines. Collaboration between poetry and architecture is rare, but John DaSilva (Design Principal of the firm and author of the book’s prose text) and GennaRose Nethercott believe the interpretation possible with the poetic form reflects the heart and soul of the architecture in ways that prose and photography do not. Nethercott, a full-time poet and winner of numerous awards, including the 2017 National Poetry Series resulting in a forthcoming Ecco/Harper Collins book, says, “PSD’s work has a certain poetry about it, so working with them on this book was a natural collaboration for me, and an exciting one.” DaSilva agrees that having Nethercott’s poetry in the book is a perfect complement to the poetic architecture his firm creates. With stunning photographs and informative text, the book illustrates the care and attention PSD takes to create homes and resorts that seamlessly blend the past with the way we live now. Joining PSD’s previous books, Shingled Houses in the Summer Sun (2008) and Architecture of the Cape Cod Summer (2011), Living Where Land Meets Sea is more than just a coffee table book, it’s a discussion of the way one special and highly successful group of creators works with the ocean to produce artistically charged, poetic homes.